It’s not exaggerated to say in the floating markets lie the outstanding beauty of the Mekong Delta. Because of the dense rivers and canals system, the locals’ lifestyle is mostly on water. They eat, sleep, cook and exchange goods right on the rudimentary boats. 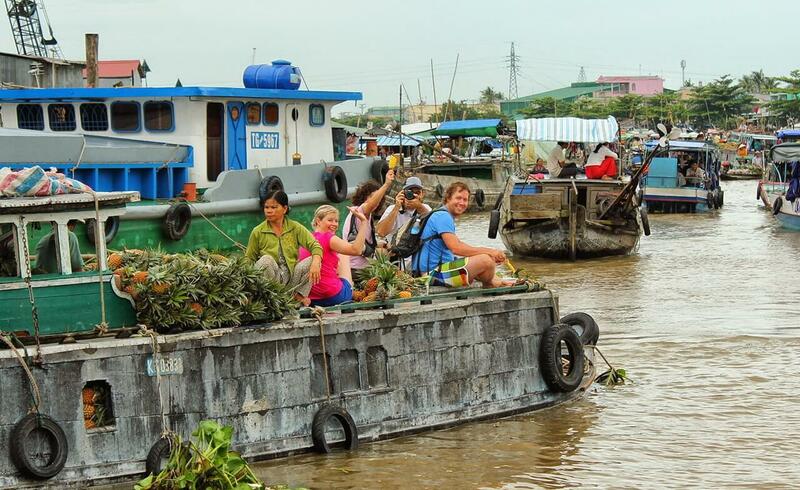 If you are touring on Mekong Delta, don’t hesitate to visit these 5 remarkable floating markets. Not only to experience this unique type of market, but also to explore a distinctive characteristic of the Western Vietnamese. 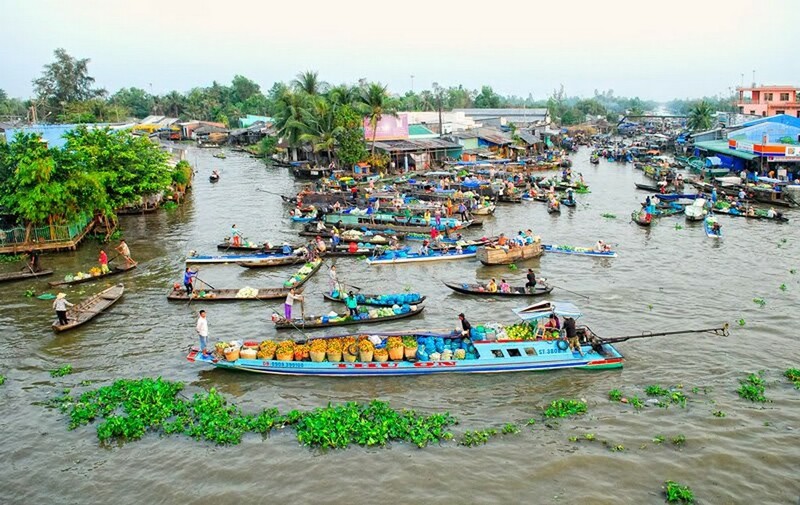 This is the biggest and also the most popular floating market in the region. It situates 6km from the center of Can Tho and takes you 30 minutes to get there by boat from Ninh Kieu port. Though the market is opened from 3 – 9 AM, we suggest you go there around 5 – 6 AM. That way you can both appreciate the spectacular sunrise scenery and enjoy the lively atmosphere, as the market is the most active at that time. Hundred of boats busy trading fruits and agricultural products. Besides tropical fruits, which is the most famous product here, you’ll see a wide range of veggies, food, commodities, all hung on top of a long bar in order to attract the customers. As all the other market in Vietnam, you don’t only come here to buy, but also to eat. If you feel hungry after a round of shopping, just grab a plastic chair and pick a food vendor. From common breakfast like rice noodle and soups to exotic dessert like coconut-leaf-cake or banana pancake. Finish off with a cup of coffee while watching the boats paddling along the river, and that’s how you start off a perfect day in your Mekong Delta tour 2018. Different from Cai Rang market or any other market, Cai Be market is opened all day long, so you can visit it anytime you want. This market is located at the intersection of 3 Provinces: Vinh Long, Tien Giang, and Ben Tre. 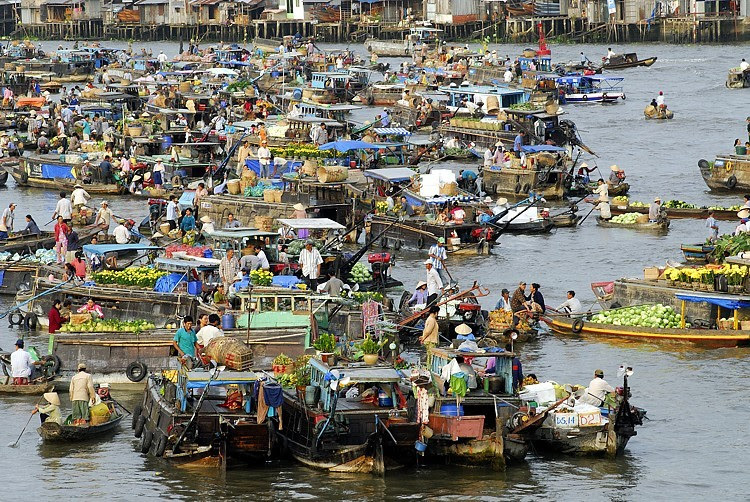 Many tourists choose this floating market for your tour on Mekong River for its close distance from Ho Chi Minh City. You’ll be amazed by the poetic sight along the river banks, with stilt houses scattered and hundred lines of coconut trees. Apart from the popular specialties like fruits, seafood, animals, and materials, you can even buy some of the local distinct souvenir, such as sweet mandarin, coconut candy, and coconut soap. This old floating market in Mekong Delta cruise is 300-meter downstream of the Hau River. It is normally small and relaxed, but the market gets really busy on the days the tide rises high. Remember to try “ca chay” (burned fish), cause you can’t find this special dish anywhere else. Visiting Tra On market, your eyes will be treated to a colorful feast of full-bloom flowers and fresh fruits. Moreover, the sellers will pour candy into your ears as they sing romantic, lyrical songs with their sweet voice. Listen to their mellow singing and watch the beautiful landscape is promising to be a marvelous travel experience. Right at the intersection of five rivers is the oldest and busiest floating market. The five rivers lead from five different directions: Ca Mau, Vinh Quoi, Long My, Thanh Tri and Phung Hiep. And that explains the name of the market: Five-way intersection. The market wakes up as early as 3 AM, and get busiest at 5 AM. Come to Nga Nam market, you will have the chance to witness the daily life of the locals. You can feel the generosity and hospitality of the people here. Despite the tiring trading activities to earn their living, the bright smile never wear off on their face. Such a pleasant destination for your tour on Mekong Delta, with much cultural uniqueness. 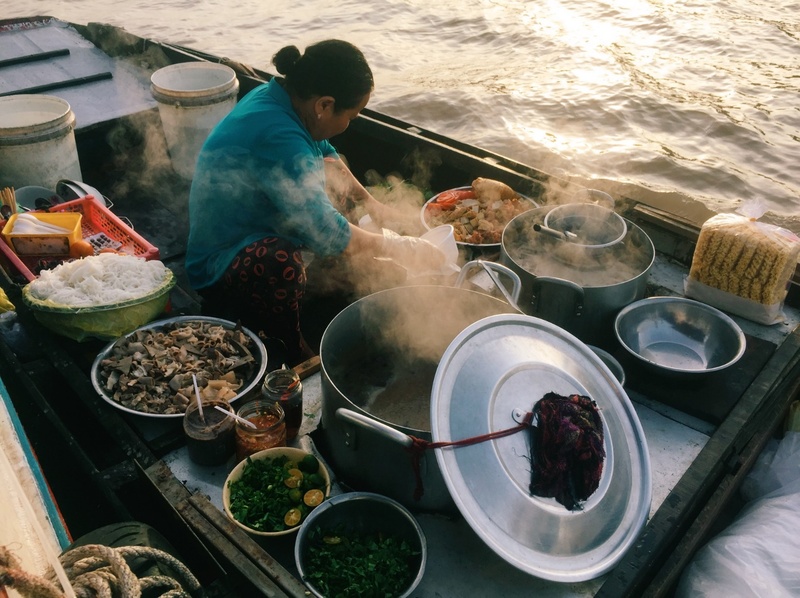 Though this market is smaller and less popular than the others, the truest, most tranquil and authentic experience on the Mekong region may wait for you here. The goods mostly sold are crops, tomatoes, potatoes, cabbages, melons, pumpkins, and of course, fruits. These farm products are transferred straight from the gardens to the boats, then to the market. In addition, you shouldn’t miss the fish noodles and pigskin cakes, they are the famous snack of An Giang. Enjoy the food and try to learn more about the locals’ culture and habit.